I was debating with myself in regard to whether today is a work day or a snow day, then realized I had not heard any traffic on my street this morning and went outside for a closer look at conditions. It is a Snow Day ~ I doubt if I could get my vehicle out of my driveway to go anywhere and if I did get it out, almost certainly could not get it back in. Guess I’ll just have to stay home and crochet & knit today. Today (Thursday) is the day I’m supposed to be here late but I’m watching the storm and if it hits on schedule, I will leave early since I don’t believe either you or I need to be out in an ice storm. I remember someone recently buying quite a bit of the soft merino wool in the light blue but don’t remember who it was. Is there any chance you have a ball or even half a ball left from your project? I have none of it left and someone needs a little more to finish a sweater sleeve for a little one’s rapidly approaching birthday. Please. The shop’s new email address is 1YarnBasket@gmail.com. Both yarnbasket and yarn.basket were already in use at gmail. I’ve just ordered postcards announcing a prize drawing related to this email address so watch for the mailing ~ hopefully in about 2 weeks. Is anyone within a reasonable radius of Pittsburg interested in a workshop, knit-along, or crochet-along? If yes, what type of project are you interested in? I’m currently in “shawl mode” with 4 crocheted shawls started since January 1; should finish the 2nd and 3rd ones today. Oh, wait a minute, that knitted piece I started Wednesday might be my 5th shawl ~ it is wide enough for a stole but I’m not sure if it is going to be a stole or a neckwarmer. While in my relaxed state in the midst of a long row, other projects ideas play through my mind: facecloth with hearts for Valentines Day and/or Mother’s Day; a new kitchen item design I’ve actually started; another pair of gloves to test that pattern; a warm cap to replace the one I’ve been wearing three winters ~ but wait, do I want a cap or a wimple? I will be a bit late opening the shop on Saturday but hope to be there by 10:45 or so. I apologize in advance for any inconvenience this may cause anyone. 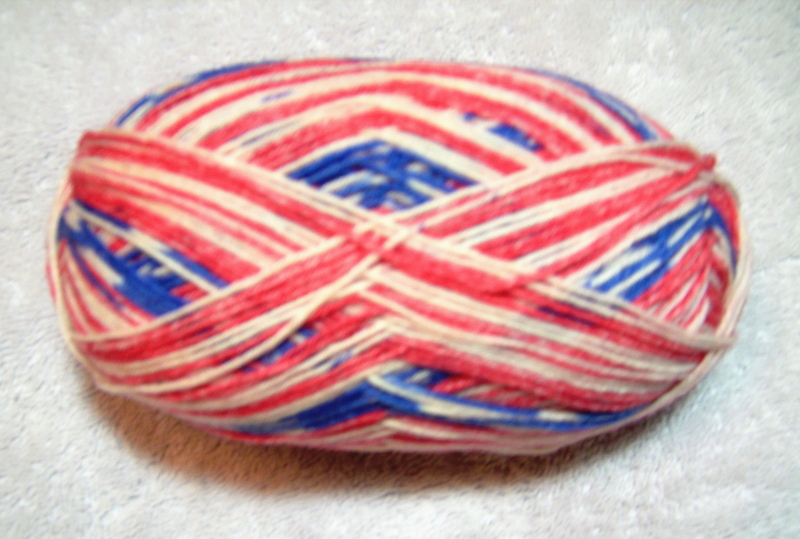 Oh, the ball of sock yarn pictured in January 13’s post whispered to me that it wanted to be a Mock Faroese Shawl (design by Lily Chin). I had three balls of the colorway available and have used almost all of one so far. The shawl is now approximately 21″ long at the center back and has a “wingspan” of about 43″. This is my 4th shawl since January 1. Shawl #1 has been finished & gifted; #2 is ready for blocking; #3 (the bright red, yellow & green one below) ate up all the yarn I had in that colorway so had to be set aside until another order arrived. I’ve also been working on an original design for a kitchen item and have a couple more designs simmering in my brain. Must keep reminding myself I really need to get some socks finished. Especially since a new order of sock yarn arrived at the shop yesterday and my fingers are itching to try some of the Endurance Sock. But I already have a least 3 pair on the needles so I seriously need to finish at least 2 of them before starting yet another. Well, er, it isn’t the day that is sick, it’s me. I just don’t feel well and on the chance I might be contagious, I decided it was better to stay home in bed so I don’t risk sharing whatever it is. I hope to be up & about tomorrow. There are 3 balls (3.5 oz, approx 460 yds ea) of this yarn sitting there wanting to be turned into something useful or decorative. They were intended to become socks but have been whispering about hugging someone’s shoulders instead of their feet. Any ideas what they should become? I’ve been playing with dolls again. 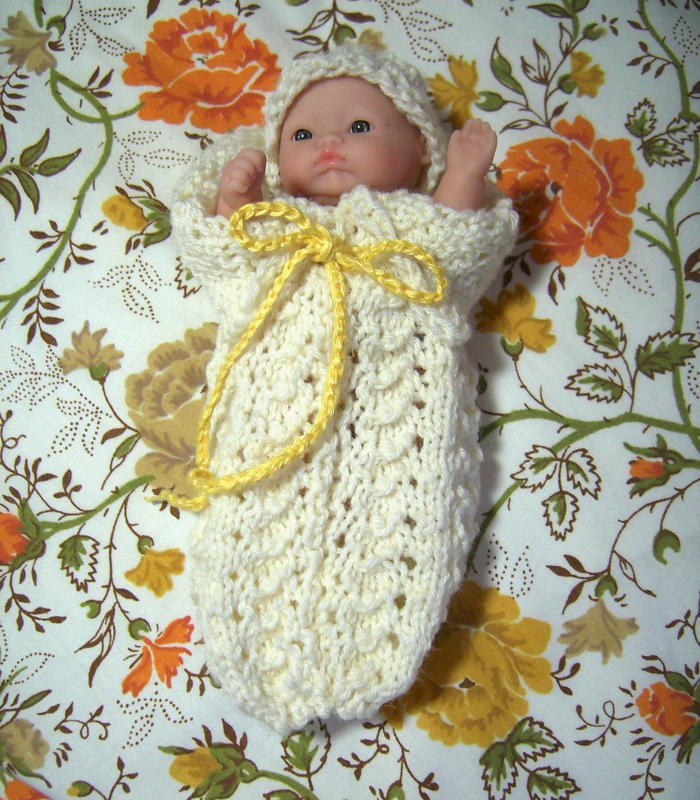 When I finished the itty bitty doll dress, bloomers & cap for the youngest grand’s Christmas I wasn’t much in the mood to play dolls again for a while but this poor thing was cold so I knitted her a little sleeper & cap. 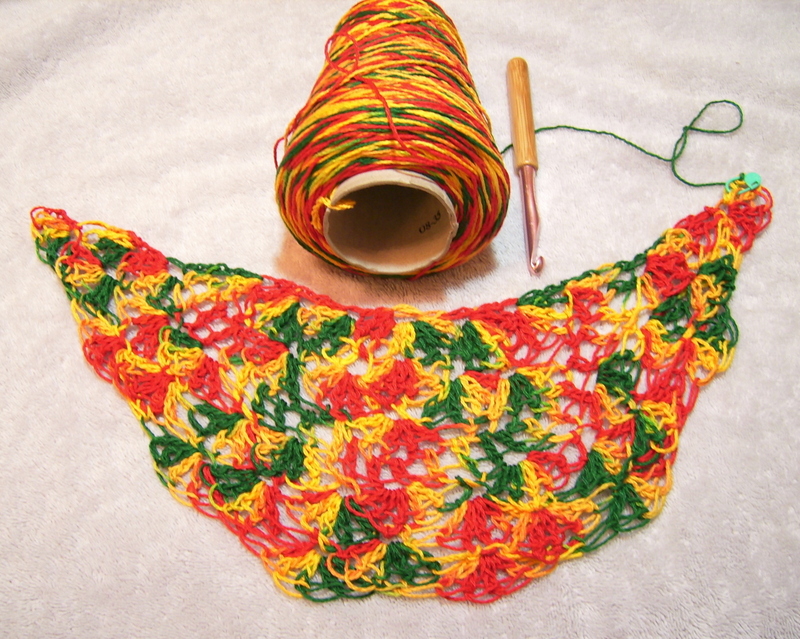 This is the shawl I currently have in progress. The pattern is Tea Wrap from the Lion Brand website and the yarn is Country Cabled Cotton, DK weight, in colorway Mexicali. I’m calling it my summer garden shawl because the swirl of colors reminds me of an old fashioned flower garden in the full bloom of early summer.